You agree to appear at Comic Con in Austin with your fellow geek authors. In a mermaid costume. For two days. Did I mention the seaweed boa? You put physics and economics jokes in your manuscript and your agent tells you that maybe this is not as funny as you think it is. But you believe that giving a character a t-shirt that reads ‘Fission Chips’ is hysterical. And that the joke “Two protons walk into a black hole… that’s the joke” is also the funniest thing ever. Really. You Google ‘nerd t shirts’ while you’re eating your lunch. More than one day a week. You still know the titles of every BTVS episode. And can still quote lines. And if someone says anything close to ‘dance of joy’ your first thought is of Season 2 of Angel when the gang went to Pylea. When you realized that you now knew and worked with the blogger who used to blog as Moonrat, you were happy for like a million days. Maybe more. You saw The Avengers on opening weekend. And you knew that you had to stay seated when the final credits rolled because it wasn’t really over. You also saw The Cabin the Woods. And chatted with your fellow geeks about how it was a meta-horror genre movie. Possibly too meta. But whatever. You played viola in the high school orchestra. And were first chair. And dated the 1st chair bassoon player. You own a full collection of the paperback novelizations of the original Star Trek series. You used to write Star Trek fan fiction. Before there was the Internet. Yes, you and your geek friends exchanged yellow legal pads of manuscripts. Mostly about Mr. Spock’s love life. You now believe that if only you had titled it Fifty Shades of Spock, you would be on easy street now. You continue to believe that there is such a thing as a tesseract. You wish there were more people who would get excited about the Baba Yaga episode on Lost Girl. You screamed in horrified delight at the end of this season’s Vampire Diaries. You have worn socks with Birkenstocks. In public. But maybe only once. You could continue this list for another thousand pages. Thank you so much for your guest post, Joy! From one geek girl to another, stay Shiny! 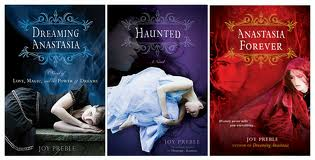 For more information about Joy and her DREAMING ANASTASIA series, visit her on her website, Facebook, and Twitter! Joy is so wonderful! Thanks for hosting this! Dreaming Anastasia was really good it kept me captivated, it was definitely a page turner. I would define recommend it to anyone who likes historical fiction.